The Folk Choir: The Folk Choir in Concert! The Folk Choir in Concert! On Friday 22 April, The Folk Choir is performing a set of our songs as the support act to John Thompson's new show. We are very excited to be performing, and all the details are on the flyer below. 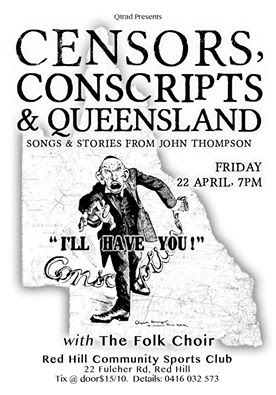 Censors, Conscripts and Queensland (Songs and Stories from John Thompson), supported by The Folk Choir. 7pm, Friday 22 April, 2016, at the Red Hill Community Sports Club, 22 Fulcher Road, Red Hill, Brisbane. Tickets at the door, $15/10. Bar open, and supper available.